Did it begin when we first travelled from England to Canada for our honeymoon in 1994? We did see a lot of the country on that trip, flying into Vancouver, seeing the sights and then boarding a train to Toronto. The train trip gives you an idea of just how much peace and open space there is. Magnificent mountain ranges, wide open prairies, then lakes, trees and rugged hills. During further visits we talked about living in Canada and in March 1999 went to an emigration seminar and decided to apply. Next decision  which part of Canada, as it is a big country with lots to offer. Not wanting to lose contact with the canals we opted for Ontario and the Rideau canal system. So in September 1999 we took another trip. This time we looked at the cost of living and possible means of making an income. We liked the idea of a B&B. Waterside properties abounded and all very cheap compared to England. Then we walked into a house in Westport. The view was spectacular and the house ideal for a B&B. Then started the waiting game all the while hoping the house didn't sell. In February we returned to see how cold it really got. Very  minus 25 Fahrenheit ! However with bright blue skies and lots of crisp white snow it was quite beautiful and possible to get about if properly wrapped up. We started to make friends in the village and still wanted the house just as much. In March we had our medicals, an experience in itself, but eventually we were both declared fit. Back to waiting. In April we committed ourselves to buying the house subject to receiving visas. June 1, 2000, almost a year after sending in the forms, the visas arrived and we could at last make arrangements to move. We now had 12 months from our medical to get to Canada. However we decided we wanted to be in before the winter. That gave us 3 to 4 months. Where do you start? It's such a big step. We shopped around for a moving firm that specialized in transatlantic work. Next step - we had to sell the house. Typical house sale when you are in a rush - purchasers dropped out at the last moment! New purchasers found. They had cash and want us out yesterday. Less than 5 weeks later we were homeless and booked to fly out. We had to be in Canada before the container arrived as customs will not allow anything in unless you are there to receive it. The cats were to follow when we were settled in the house. We ended up living on Xanth, a 50 foot (15 m) narrow boat, for 3 weeks in Pyrford marina on the river Wey. Both of us gave up our work and set about trying to say goodbye to friends and family. Xanth had been one of our dilemmas. Did we sell her or take her with us? We didn't want to sell but the cost of shipping her from Liverpool to Montreal was very expensive. If she stayed in Britain we would not be able to use her for more than once in two years and mooring costs would soon mount up. Pointless! ... We put a great deal of effort into obtaining prices. The first reply we had was wonderful. The shipping company could take our boat across the Atlantic, but we had to get her to Brugges in Belgium first. It was going to cost as much for that part of the trip as the journey across the ocean! We then found a company who could take her from Liverpool docks to Montreal for £6,000. Added to that price was the expense of transport by truck to the North of England, with cranes at either end. She was not allowed to be put into the St. Lawrence direct from the ship because of importation problems. She had to be checked out first by Agriculture Canada (so we were told). Figures of between £6000 to £8000 were mentioned. Thats about $13,000 to $17,000 CAD. Some even wanted that much each way! We had almost decided that we would give up and sell her when Klaus, a fellow boat owner at Pyrford and a customer of David's, solved our problem. Hearing of our intentions he sent us this message: "I have a ship which can take Xanth to Canada for you." So we contacted him and asked, "How much?" NOTHING! That was an offer we couldn't refuse. His shipping line regularly runs between London and the Maritimes. OK, that's about 1000 miles from our new home but a lot closer than England. All we had to do then was confirm which ship, and when, because we had to be in Canada before it docked. This unfortunately meant we had to leave before the ship arrived in London. Xanth stayed in Pyrford until news of a departure date was received. Two of our friends Greg and Rod who work at the marina then moved her down the Thames to a small marina just past Gravesend. By all accounts the trip was quite an adventure. All the windows had been boarded up in preparation for the crossing. With two shady looking characters on the stern and heading out past the barrier she was boarded by the river police. We were expected to empty the boat completely for transportation. As it turned out we didn't do that, as we found so many things that needed to come with us. We submitted a full inventory to customs as to the contents on landing at Ottawa. The ships cranes had a lift limit of 16 tonnes, which was a bit of a deciding factor as to whether the trip was on or not. Fortunately XANTH weighed in at 13 tonnes, so was well within the limit. 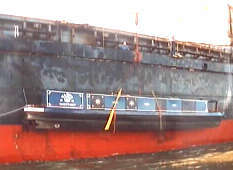 On the day of loading she was cruised alongside of the "Kent Reliant", and hoisted up and over the side. It had been planned to stow her in front of one of the deck hatches, but as it turned out there was room in hold number 3. Now Xanth is 50 feet (15 metres) long, but she fitted across the hold. Big ship! The ship's captain was expecting a rough crossing, and therefore had 4 steel lugs welded to Xanth's hull. He then attached very substantial chains to keep her steady. By all accounts these precautions proved worthwhile. At one point during the crossing a list of 41 degrees was recorded. We are glad we flew over, although the guests cabin had been offered. The ship was due to make several stops on the way to Pictou, so was not due until the 6th November, 2000. One thing you learn very fast about cargo ships is that their schedules alter about as often as the weather. Up until the day before she was due to dock, the destination port was changing at least once a day. The shipping agents for Kent Line put their hearts into the event with such enthusiasm we were amazed. Their Canadian agent Rob deserves a medal for his efforts and organization skills. The ship might be diverted into Eastport, Maine, to load wood pulp into holds 1 & 3. Xanth would be in the way and would have to be unloaded. OK, not much difference in distance from her original planned port, but she was cleared for entry into Canada not the United States. After some mild panicking, we contacted the U.S. customs who turned out to be incredibly understanding. Providing we took her straight out via the nearest road border they would look the other way. Weather forecasts for the Maritimes told of settling snow so when we set out from home to meet the ship on Friday 3rd November we went well prepared. We had a 900 mile journey in front of us. Following the St Lawrence Seaway we passed Montreal & Quebec City. After an overnight stop we called Kent line to confirm the port of arrival. At last we had a straight answer - Eastport. When we arrived we discovered a very small New England village whose community makes a living from fishing and tourists. It was Saturday evening and dark. Where was the port? We found a small area with fishing boats and a ferry, but no big ships. We waylaid a very young looking policeman who escorted us out of town to the "new port'. We had booked into a B&B for the night over looking the bay. Our photos of Xanth were eagerly looked at by our hostess and her friends. Her son, who helped at the dock, confirmed that the ship was due early next morning. Xanth was due to be unloaded at 7.30 am before the cargo loading could begin. So next morning we arose early and had a hurried breakfast. We set out for the dockside at about 7 am and arrived a few minutes later. The ship was there. Big sighs of relief all round. However due to heavy rain being forecast there would be no loading that day. The local unions would not allow the ship's crew to unload Xanth as it is in breach of regulations. So she would have to stay in the hold until the weather cleared. The truck, organized by Rob, did not arrive so obviously he had managed to contact the driver. We went on board to meet the captain and descended down many vertical ladders to the bottom of the hold. Xanth looked very tiny. Loading was rescheduled for 6 am next morning. The captain and port manager assured us that all would be OK, but we would have to wait a further day. Next problem - we would need somewhere to sleep. The captain insisted we stay on board as his guests. We explored some of the coast in the rain and returned that evening. Tides in this part of the world are some of the highest in the world. It always seemed to be high tidy when getting on or off the ship via its almost vertical gangway. We were given a guided tour of the ship, fascinating stuff, before being fed, watered and given comfortable cabins for the night. Things were looking up. 5.30 am and the phone rang in the cabin. David dashed to answer it in the dark and found the receiver was taped down due to the rough crossing. After wrenching it free he was told "this is your wake up call". 6:15 saw us on deck with cameras poised as the hatch covers are removed. The truck appeared on the dockside, we breathed a sigh of relief. A gaggle of local dock workers came on board and peered into the hold. 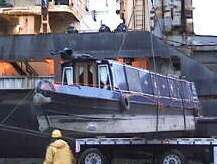 6:30 Xanth was at last lifted clear of the ship and carefully lowered onto the waiting truck. Strange looks from all around. Nobody had seen a narrow boat before. We thanked the captain for his hospitality and left him to get on with earning his living. Sunbury Transport moved the boat from Eastport, Maine to Merrickville, Ontario. They quoted $2,087 originally for a trip from Pictou, N.S. to Merrickville. When the boat arrived at its destination, we were delighted to be told that they were sending us a $200 rebate for the shorter journey. We did not know until the last minute where Xanth was going to arrive in North America, but they just took it all in their stride and sorted things out. We followed the truck to St. Stephens and passed through customs without a hitch. We arranged to meet the truck driver two days later at a boatyard in Merrickville, Ontario. We had previously arranged with Aylings yard, one of the few marinas with a large enough lift, to store Xanth for the winter. Sure enough, 9 am Wednesday morning the truck arrived and she was safely unloaded onto Canadian soil. The Rideau canal shuts down in October each year and reopens in May. We will launch her in the spring and bring her home to be moored at the bottom of the garden (Westport, Ontario). Many people are looking forward to seeing her and she will no doubt causes quite a stir. (The Rideau Canal was designed by British engineers and looks quite similar to canals in England, but the boats in Canada are very different from traditional British canal boats. The whole of our lives is one big adventure at the moment. So much to do, never quite enough time to do it. Unlike Britain, we had wonderful weather in autumn 2000, and with an acre of ground there was much to do in the garden. There was also lots of tempting little lanes (dirt tracks) to explore. Come the spring our B&B will be up and running. The village where we live is a real tourist stop with many yearly events  antique shows, classic boat gathering, and art show to name but a few. It is also very popular for weddings. We will be glad to welcome anyone who would like to visit the Rideau Canal. It is a beautiful and fascinating waterway, built by the British in the early 19th century. The canal runs between Kingston on Lake Ontario, near the 1000 islands and Ottawa, Canada's capital. There is much to see in this area within reach of Montreal, Toronto, Niagara Falls and New England. Anyone wanting further details or advice on travelling in Canada is welcome to contact us.